Highlights: After a rather steep walk up a private road, you are rewarded with a great hike in the hills above Happy Valley, with outstanding views, and one of the best picnic spots around for lunch or dinner. It takes about an hour to get to Russell Peak and about 30 minutes to get back down (shorter route). I like to stop at Whole Foods, Diablo Foods, or Chow and pick up a picnic lunch and cold beverage and bring it along in a daypack. 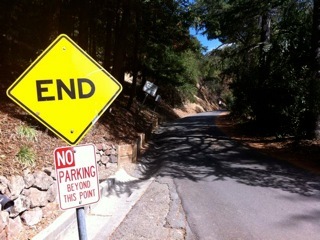 Trailhead: Head up Panorama Drive past the “END” sign. This hike starts out with a rather steep walk up Panorama Drive, but don’t be deterred, it will be worth it. You will reach a final house on the left and a gate across the road. Continue hiking until you reach an unmarked fire road that heads off to the left. 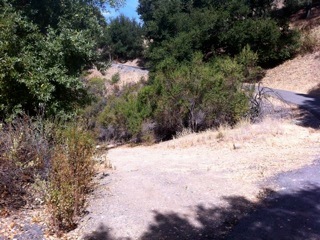 This is part of the Mariposa Trail, but there is no sign. Mariposa means butterfly in Spanish and this trail is named after the “clouds” of butterflys that used to be found along this loop a few decades ago. Apparently they’ve moved on. 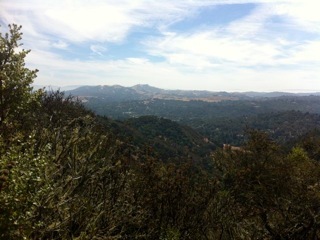 The Mariposa Trail winds west, along the side of the hill with great views out over Lafayette for about a mile or so. When you reach a three-way junction you’ve arrived at the Russell Peak Trail. Take a right and you’ll start climbing towards Russell Peak. On your left you may notice the Leuschner Observatory, built in 1886 on the U.C. Berkeley Campus and moved to Lafayette in 1965. 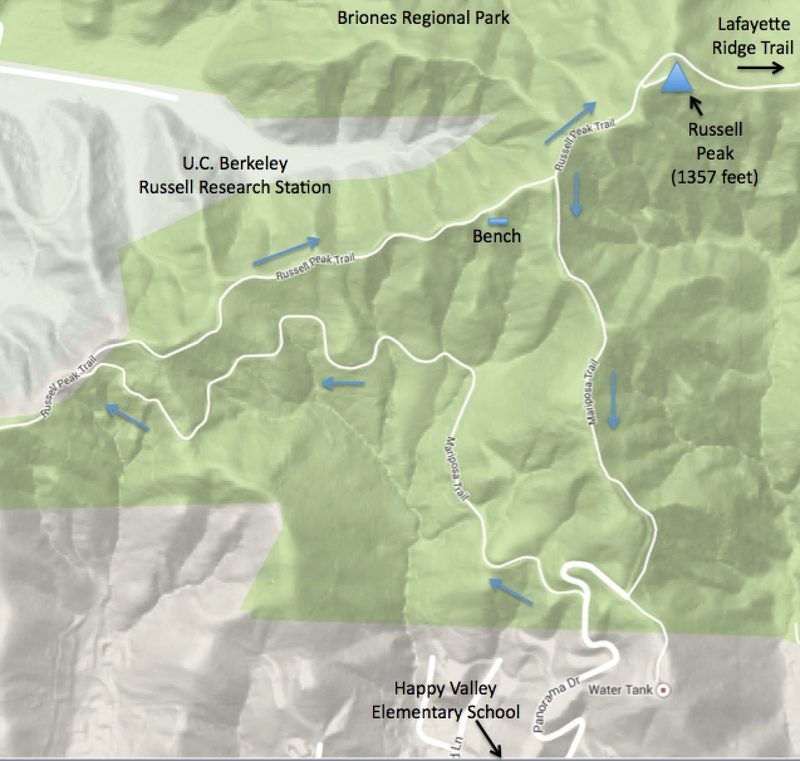 It is located on the Russell Preserve or Russell Research Station, a 283 acre research facility of the University of California’s Center of Forestry. Since 1961 is has provided a location for wild land and forestry research. The University of California land is immediately to the west of the Russell Peak Trail. Right after a really steep section you may notice a little trail on the right that goes out to a charming bench with a great view (see photo). 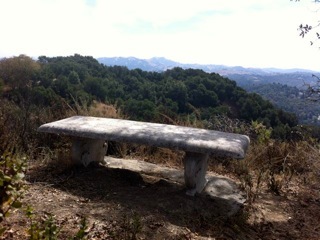 The bench is a memorial to a woman named Janet who apparently loved the view from this spot. Continue until you reach another three-way junction. Take a left and continue a couple tenths of a mile until you reach Russell Peak. There is no sign for the little side trail to Russell Peak. 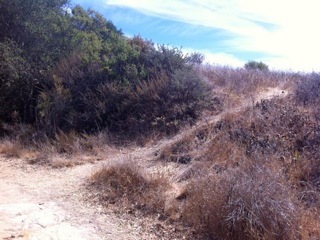 After climbing a pretty good hill, look for a little trail on the right that heads up to the top (see photo). There is now one of those orange gas line markers right where the side trail goes to the peak. If you’re on track, you’ll find a brand new, large picnic bench after about 40 yards or so. If you reach the Lafayette Ridge trail then you’ve gone too far. Russell Peak is at 1357 feet and is one heck of a spot! You can see a complete Panorama from Mt. Diablo all the way across to Round Top at Sibley and more. Time to relax for 20 or 30 minutes and take it in. 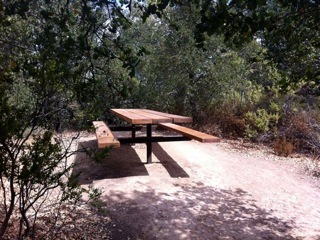 A brand new picnic table at the top! 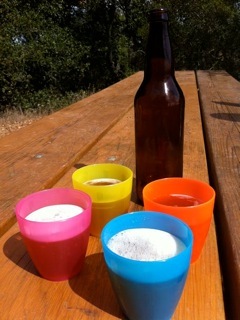 A cold beverage is a nice touch! On your way back down, you’ll return to the same three-way junction, but instead of taking a right and going back the way you came, just continue straight down Mariposa Trail. This is a shorter way back. You’ll reach a paved road where you take a right and will pass the fire road that you took before. The route is in the shape of a triangle. If you spend 30 minutes at the peak, the hike will take around two hours or so. This hike is best in spring or fall, or summer days when it’s not too hot. Enjoy and share your feedback by posting a comment. I love this hike for its incredible scenery and the fantastic park bench at the top. A great variation of this hike is to do it in reverse order — skipping Mariposa Trail and heading straight up, and then taking Mariposa on the way down. I found this quicker, although it’s hard to complain about either way, they’re both great! Thanks Steve for sharing this hike with everyone. My nephew and I hiked here last night. This has been a favorite for my boy scout troop for many years. The table at the top was an eagle scout project put in by one of the Quinn boys from Lafayette Troop 241. Pretty funny that EBRP didn’t know the old table there had fallen into dis repair. Matter of fact they didn’t know there was a table there at all. Our eagle scout showed up with pictures of the dilapidated table on Russell Peak. The board had to get back to him months later to let him know he was right and they would allow him to put a new table there. Thank you for letting me know about this trail, even though I’ve lived in Lafayette for a few years I never would have found it by myself. Beautiful trail, and the picnic table at the top is very nice indeed. The tiny trail to the table would have been impossible to find without the description above…thanks again!